Driving safely is the highest priority. 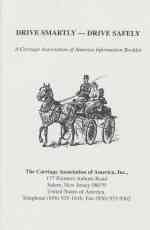 The Carriage Association of America has published an informational booklet which covers the basics of safe driving. For more information, click here. According to the October 2008 report from the National Fire Protection Association, U.S. Structure Fires in Barns, just under 1,100 fires occur every year in barns and stables. These fires average 2 civilian deaths and 10 civilian injuries each year and result in $32.4 million dollars in direct property damage. The four leading causes of fires in agricultural storage facilities are heating equipment at 21% (with heat lamps being the largest portion of that, followed by heaters); electrical distribution (wiring) or lighting equipment at 14%; arson at 7%; and lightning at 5%. Sixty-seven (67%) of all barn fires result in the destruction of the entire barn. I am a horse owner and a fire fighter. I have traveled to horse shows across the south and I have provided the fire safety stand-by for local horse shows, most notably the Germantown Charity Horse Show. As a fire fighter, I responded to a fire in Germantown years ago where three horses died in their stalls. An electrical short in heat tape used to keep the barn water faucet from freezing started the fire. I have been in barns that had fire detection systems and fire sprinkler systems, and were clean and orderly. I have been in barns that held so many fire hazards it was a wonder that the barn had not spontaneously combusted. Mostly, I have been in barns that fall somewhere in the middle. I want to share with you some safety tips to help you keep your own barn safe. If you board your horse, use these tips to inspect your boarding facility for fire hazards and bring anything you find to the attention of the owner. Barns are inherently combustible. Most are made of wood and/or wood products. While it is a good idea to store hay in a separate building at least 100-feet from other buildings, most horse owners (myself included) store hay in the barn as a cost saving measure since a separate hay building is expensive and requires land. Many people bed stalls with shavings, and store these in the barn as well. Horses need fresh air and good cross ventilation to stay healthy. The open construction of barns is ideal for rapid fire growth because any fire that does start will have plenty of oxygen, and the wood, hay, and shavings provide plenty of fuel. If you do store hay and shavings in your barn, keep the storage neat and orderly. Before storing hay in any barn, make sure that the hay has been cured properly. Cut hay must have 20% moisture or less for the bales to be stable when stored. Wet or moist hay can spontaneously combust, so keep the roof in good repair to prevent water from leaking on to the hay. Hay with more than 22% moisture increases the risk of spontaneous combustion. Store hay on pallets so air can circulate underneath and around the hay and heat can escape. Sweep up and remove loose hay piles from the hay storage room and barn aisles. Twenty-seven (27%) of barn structure fires started when hay or straw were first ignited. Baled shavings are somewhat safer than bulk shavings because the shavings are tightly packed in the plastic bale, which slows the rate at which fire will spread. Discard the plastic from bulk shavings in metal trashcans with tight fitting lids. Establish a no smoking policy, post no smoking signs, and enforce the policy. Not smoking in a barn is common sense, but every year at the Germantown Charity Horse Show, my fire fighters find horse owners smoking in the barns and have to enforce the no smoking ordinance. There is simply no justification for taking such wanton risk as smoking in a barn: it needlessly exposes animals and people to the risk of injury or death from an entirely preventable fire. Barns need electricity, and electricity provides a source of ignition. Avoid the temptation to do your own electrical wiring. While wiring a barn or extending a circuit may seem easy, the National Electrical Code contains many requirements for installing electrical circuits safely, so hire a licensed electrician. Extension cords are for temporary use only. If your barn is “wired with extension cords,” you need to hire an electrician to replace those cords with permanent wiring and electrical outlets. Consider you electrical needs, including how many outlets you need and how many light fixtures you need. Do you use fans? Do you want an outlet next to every stall and at every cross-tie? Do you have any appliances in the barn, such as a refrigerator, television, etc.? Do you want a light in every stall? Do you want perimeter lighting around the barn? All of these items require a certain amount of amperage (amps). An electrician can add up the amount of amperage you need and determine the required size of the electrical wire needed to provide the amps required. Run all electrical wiring in conduit to protect the wires from damage from people and animals. Ground-fault interrupting circuits (GFI) are required by code where electricity is in close proximity with water. GFI receptacles and circuits will detect current leakage and will shut the power off to prevent a person or animal from receiving an electrical shock. Use weatherproof covers on electrical outlets exposed to water, including rainwater and spray water from a garden hose. For other outlets, use childproof caps to keep insects and dust out of the outlet. If light fixtures are located so that it might be possible for a horse to reach them, including the possibility of a horse rearing in a stall or barn isle, reposition the light fixtures or install light fixtures with protective guards to prevent the horse from breaking the light bulb. On the four-foot and eight-foot long fluorescent light fixtures, use plastic tubes to protect the bulbs. Keep your roof in good condition to prevent roof leaks. Water leaking into a light fixture or into an electrical outlet can cause a short that can start a fire. If you use heated buckets in the stalls, know that each bucket can use 12 amps of electricity. Several of these used on the same circuit could overload the circuit, which could start a fire. The same is true for water trough heaters. Such heaters usually require 12 to 15 amps of electricity, so make sure that they are connected to a circuit with sufficient amperage. If you must use an extension cord to run power to a trough heater, get a cord rated for 20-amp service as amperage decreases with distance. Using a 20-amp cord will lessen, but not eliminate, the possibility of the extension cord overheating. To shut off the power to the barn in an emergency, you should have an electrical disconnect for the barn. This could be a circuit breaker in an existing breaker box or a dedicated switch located in the barn. Label the switch or circuit breaker accordingly and make sure that everyone knows where it is located. Keeping the barn neat and clean is a very important part of keeping your barn fire-safe. Keep barn aisles clean and free of clutter so that there is a wide and direct path to use if you must get the horses out of the barn quickly. Use metal trashcans with tight fitting lids in your barn instead of plastic trashcans. If someone does discard a cigarette or something hot in a metal trashcan with a lid, a metal trashcan will not melt as the plastic can would and the tight fitting lid will starve the fire of oxygen. If you use oil-based products to clean you tack, dispose of the cloths used, preferably by removing them from the barn and disposing of them in a metal container. If you oily rags from working on farm equipment, dispose of them properly and away from the barn. Storing power equipment such as tractors, lawn mowers, line trimmers, chainsaws, etc. in a horse barn is not recommended. However, if you must store power equipment in your barn, do not store the gasoline and/or diesel fuel in your barn. Store the fuel away from the barn and in approved safety cans. The plastic cans one buys at the hardware store are not safety cans. Safety cans are expensive, but they provide protection from accidental spills and keep flames from flashing back into the fuel can. If you store oil based cleaning supplies, clipper grease, alcohol, and other combustible liquids in the barn store them in a metal box or container with a lid that will close. Do not store ammonium nitrate fertilizer in your barn. Ammonium nitrate is an oxidizer. If petroleum products are exposed to ammonium nitrate, a fire can result. Keep dust and cobwebs down. Remove the cobwebs every week or so. Provide plenty of metal trashcans with tight fitting metal lids. Keep the manure pile away from the barn. Keep the trashcans empty and avoid using the barn as a general storage building for your operation. Around the outside of the barn, keep trash and litter picked up so that it does not accumulate against the side of the barn. Keep the grass and shrubs near the barn mowed to create a fire break in case of a grass fire. If your barn is far off the road, fire apparatus may not be able to reach it. For good access, a fire truck needs a driveway at least 12 to 14-feet wide and overhead clearance of at least 11-feet. Fire apparatus can weigh 24,000 pounds or more. Can your driveway handle that much weight? For special risks, fire departments create a pre-plan that they use to evaluate the risk and develop a response plan, and a site visit is required to develop the pre-plan. Call your local fire department and request that a fire inspector come to your barn to evaluate the fire department’s ability to access your property. The fire inspector will evaluate the fire department’s ability to access your property, the amount of water the department would need to extinguish your barn if it were on fire, whether that water is available, and other items to create the pre-plan. The fire inspector can give you important tips on how to improve fire safety in your barn. Develop an escape plan for people and an evacuation plan for the horses. Your local fire department can provide assistance in developing the plan. Post the plan for all to see and discuss the plan with others who use or work at the barn. Practice the plan every month, including having a practice session at night or with the lights off. Horses are creatures of habit, so the more you practice the evacuation drill the more accustomed they will become to being lead from the barn in a hurry. Keep halters within easy reach of stalled horses. It can take between 30 and 60 seconds to place a halter on a horse and lead the horse to safety. Can you do that if there is fire, smoke, and darkness present? Expect to discover problems the first time you hold the drill. Use this as a learning experience and correct any problems you find before the next drill. If you have boarders, educate them about the escape and evacuation plan and make sure they participate in the drills. If you have a large barn, consider installing emergency lighting that comes on if the power fails. This could help you see if you have to evacuate the barn at night. Keep flashlights handy in case the power goes out. If not already present, consider adding an exterior door to each stall to facilitate evacuation in an emergency. Fires are classified by type based on the material that is burning. Class A fires are fires in ordinary combustibles, including wood, paper, cloth, and most plastics. Class B fires are fires in flammable liquids, including gasoline, diesel fuel, and grease. Class C fires are fires involving energized electrical equipment, including circuit breaker boxes and machinery while there is electrical current present. For use in a barn, a fire extinguisher rated to fight these three types of fire. These are multipurpose fire extinguishers and you should see the letters “ABC” somewhere on the box and on the extinguisher. In addition to the letter classification, fire extinguishers are rated on Class A and Class B fires based on how much fire they will fight. The higher the number, the more fire that can be fought with the extinguisher. The Class C rating does not have a number: it simply indicates that the chemical in the fire extinguisher will not conduct electricity. You need a fire extinguisher with a minimum rating of 2A:10B:C. This fire extinguisher will contain between 4 and 5 pounds of fire extinguishing chemical and weigh between 8 and 12 pounds. The weight of the full extinguisher is important because if you cannot lift and carry the extinguisher you cannot use it properly. If you can lift, carry and use a larger extinguisher, consider a multi-purpose extinguisher with a minimum rating of 4A:60B:C, which can weigh about 18 to 20 pounds. Extinguishers have plastic heads and metal heads. The metal heads, made or steel or aluminum, are more durable than the plastic heads. Place extinguishers no more than 50-feet apart in a barn. Mount extinguishers on the wall; do not set them on the ground. Locate the extinguishers along paths of travel and near exits. Expect to pay between $30 and $60, depending upon brand and quality, for a 2A:10B:C extinguisher, and twice that or more for the larger extinguisher. Fire extinguishers are easy to use if you remember the PASS method: Pull, Aim, Squeeze, Sweep. Pull the pin, aim the extinguisher at the base of the fire, squeeze the handle, and sweep the extinguisher back and forth to cover the fire. You local fire department may offer fire extinguisher training classes. Once installed, inspect every fire extinguisher monthly to insure that they are in good working order. Check the pressure gauge and make sure that the needle on the gauge is in the green zone. Check the pull-pin and tamper seal to see that they are intact. Check the nozzle to make sure that a wasp or other insect has not built a nest in the nozzle that will prevent the extinguisher from working. Check the extinguisher for any physical damage as well. Have the extinguisher serviced by a licensed fire extinguisher technician (found in the yellow pages under fire extinguishers) if the unit is low on pressure, has been discharged or is damaged. Water is very effective on Class A fires, and most barns have water hoses. A water hose does not flow a lot of water, so it will be effective on only small fires, so do not be lulled into a false sense of security because you have a garden hose. Do not use water on Class B flammable liquid fires because the water will not extinguish the fire and the fuel will float on top of the water, which could spread the fire. To avoid the risk of being shocked do not use water on Class C fires. Make sure that you have a water hose or hoses long enough to reach all parts of the barn. Even if you have enough water hoses, you still need fire extinguishers for the types of fire that you cannot fight with water, and to be prepared if your water faucet freezes. If you discover a fire in your barn, call 9-1-1 before doing anything else. You should only attempt to fight a fire if it is small and contained and only if you have a clear path behind you to escape that is free of fire. A fire doubles in size every 60 seconds. If the fire has spread beyond the early stages, it is time to evacuate the barn. Be sure that the fire extinguisher is large enough to put out the fire before attempting to fight the fire. The fire department recommends that you evacuate and call 9-1-1 if fire is too large for your fire extinguisher or garden hose. Do not become a fire casualty or fire fatality. An alarm system can provide constant monitoring of the barn for fire and intrusion when you are not there. Smoke detectors are not a good investment for a barn because the dust will cause them to give false alarms. Heat detectors and flame detectors are the best sensors for barns if they are part of a monitored alarm system. An alarm system will require professional installation, and you should contract with a reputable alarming monitoring company to have the alarm system monitored. The safest barns are protected by automatic sprinkler systems. To function properly, sprinkler systems must be designed by a fire protection engineer, have an adequate water supply, require installation by a licensed sprinkler contractor, and have an annual maintenance inspection. Wet systems can be installed where there is no danger of freezing. Dry systems are required if the building is subject to freezing. It is beyond the scope of this article to provide all of the information available on sprinkler systems, but a sprinkler system provides the best protection possible for a barn. For more information on sprinkler systems, contact your local fire department or a licensed sprinkler contractor. Each year, approximately 54 barn fires are started by a lightning strike. Lightning protection systems are available to protect a building from a lightning strike by carrying the electrical current to the ground. Lightning protection systems may seem simple in their design, but they have many components including the air terminal (or lightning rod), main conductors, secondary conductors, arresters, and ground connections. For proper operation and safety, lighting protection systems should be designed and installed by a professional. In most jurisdictions, you dial 9-1-1 to reach the fire department. Even if your area has 9-1-1 service, post important numbers by the telephone including the 7-digit emergency and non-emergency numbers for the fire department. Post by the telephone the address of your barn and the nearest cross street. The 9-1-1 dispatcher is going to ask for this information. It is easy to forget it in an emergency and people that board may not know the exact address of their boarding facility. Make sure that the street numbers are visible on the road so responding emergency vehicles can find your barn. Barn fires are a threat that every horse owner should take seriously. Barn fires spread rapidly and usually result in the total loss of the structure and contents. Barn fires are preventable for the most part with good building practices, following local codes, practicing good barnkeeping, and common sense. Practicing fire prevention in and around the barn will help keep you, your horses, and your barn safe. 2 Responses to "Drive Safely"
I am interested to learn driving! I grew up with horses and have taugh riding to adults, kids and disabled persons. Can you please refer me to an instructor that could teach me! Yes! We will send you an email! Thank you!